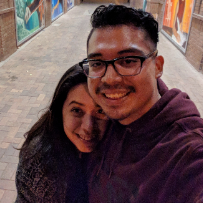 Edith, 21and Jonathan Parra 25 we are having our first child on March 26,19 we just moved to Evan Colorado not to long ago.We have no family here,we are alone and havent had much luck with finding a place to call home and have to be out of the place we are staying at in 2 week. We are look for any help that we can receive and praying that we will find a home soon. Please help us with anything you can. Any help we can get will be a blessing. Please and God bless everyone.